Vorwort von / Preface by Edgar Hilsenrath. (Deutsch u. englisch). This is the story of a man whose autobiography the National Socialists surely did not want anyone to ever read. Indeed, they did not want him to survive to write it, and for this same reason, it is a story that should not be forgotten. The author's name is Joachim Kalter, in America 'Achie' Kalter. 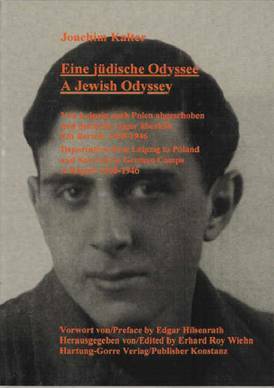 Born in 1923 in Leipzig, his family was expelled to Poland by the National Socialist government. After the occupation, he and his family ended in forced labor camps. Except for one brother, his family died in them. I was quite impressed by the simple and direct way in which the author presented his story of his family's Holocaust experiences. It is simply written, unembellished, but it sums up the essence of one family' s fate at the hands of the Nazi regime. hidden from view that could incriminate them. The Nazis kept very detailed records of the inmates of the camp, but the purpose was not to provide historical documentation on their crimes.